In this hectic world that we live in, we are all bombarded with suggestions on how to improve one’s life. Some are aspirational, some are fanciful, some are basic and mostly, they are one size fits all. One thing’s for sure, there are a myriad of lessons to live one’s life – and trying to decipher them is difficult. That’s why Tony’s book is so special – he takes it all and lays it out in such an easy manner. It is beautiful in its simplicity, its brevity and its verity. I have had the privilege of knowing Tony for many years and this book is testimony to his straightforward, sensible and warm, embracing attitude to life. His generosity in sharing his thoughts is a gift that we can all enjoy. And importantly, we can and should pass it down through the generations as what he writes is timeless. 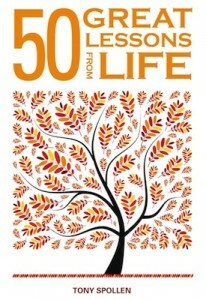 I hope that you enjoy reading 50 Great Lessons from Life as much as my family and I did.